" It's always better to be on the ground and wishing you were flying in the sky, than wishing for the ground when you are up there...the higher we rise, the smaller we appear to those who have no idea about flying". Within all of us is a varying amount of space substance. We are too busy to notice it...and its stronger in those who want to fly. It is highly responsible for that desire to fly like a bird and explore the undefined boundaries of our origin. In Naukuchiatal, all of us are very lucky to slip into those wings and fly high like a bird, touch the clouds, and be as high as the mountains!!! 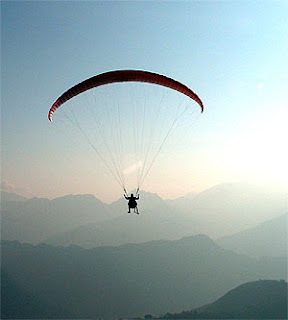 Pandegaon, only 4 kms from The Lake Resort is the 'take off" point for Paragliding in Naukuchiatal. You do not have an option of a "Solo Flight" but the pilots are well trained to give you the experience of flying "high AND alone" in the beautiful skies of Naukuchiatal. The charges vary from Rs. 1,000/- to 1,200/- and trust me every penny is worth this life time experience!!! The perfect time/season to do Paragliding in Naukuchiatal is March - June and October - December. Our advice is that you wear a track suite and sneakers while doing Paragliding. Listen to the instructions carefully and that's it...The rest will be handled by the pilot who will navigate the winds and give you a "Life is Beautiful" experience. Request the front desk to organise a flight for you. Let your Soul fly...!!! TIP: Since Paragliding is an adventure sport, please make sure that you check the equipment and the company before you decide to take a flight.